Tatlayoko has a new trail cam! It’s not the usual time of year for a TLBO blog posting but I didn’t want to wait six months to get this fun news out there. I realize there won’t be many people viewing the blog so I will probably re-post this as the banding season draws near. Caught in the act! 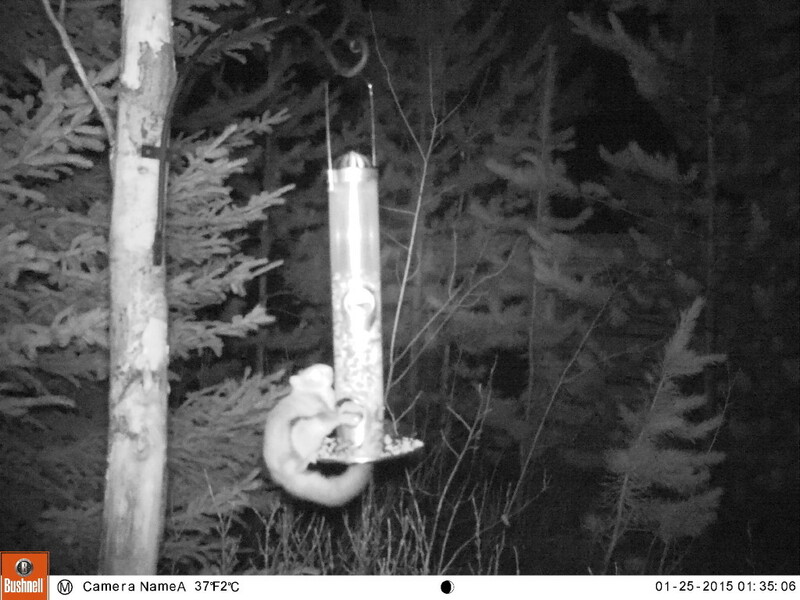 It’s a few minutes after midnight when a Northern flying squirrel ‘flicks’ unwanted seed off of our feeder. See more shots below. Thanks to a couple of generous Conservation Volunteers, I am excited to report that NCC now has a trail cam for use in Tatlayoko. I want to specifically thank Bill Grainger and James Franssen, both of whom contributed without being asked. Bill was a Conservation Volunteer at the TLBO in 2014 and James was scheduled for a week but had to drop out at the last moment. Additional top-up funds were acquired from the top secret TPCF (Tatlayoko Petty Cash Fund). Shhh! The idea for a trail cam was originally suggested by Chris Chutter, our assistant bander for a number of years. Chris purchased a trail cam of his own and tried it out around the station with some interesting night time photos. He photographed a Black bear sow and 2 cubs, a Lynx, a few Mule deer and a Cougar. In the case of the Lynx and the Cougar, there was no way to know they were using the area other than via the trail cam. Consensus amongst the crew was that the TLBO needed its own camera that could then be used throughout the banding season but also year round, including during the spring banding session conducted by Barry Lancaster. From a safety perspective, it might be useful to know what large predators are accessing the area at night, particularly Grizzly bears. I did some online research to decide which camera would be best for us. But in the end, it was advice from a co-worker that helped the most. 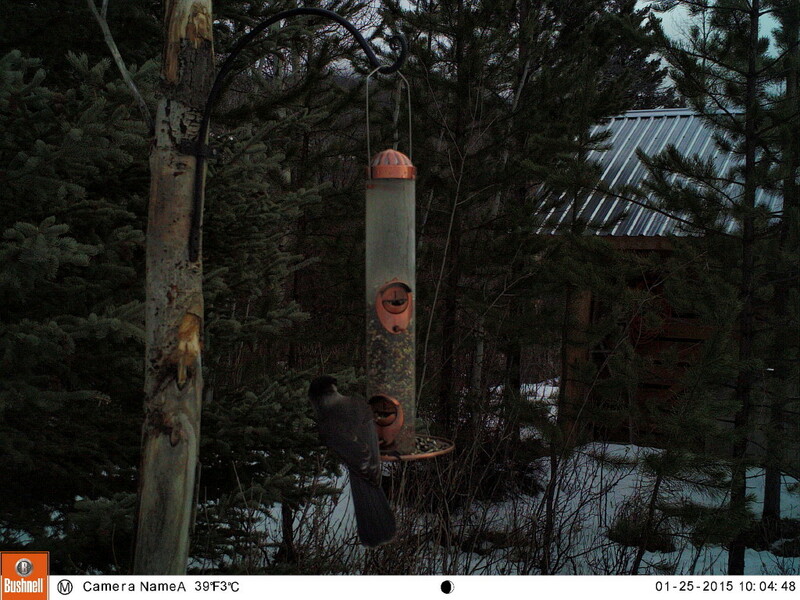 Richard Klafki, Stewardship Coordinator in NCC’s CanRoc program area, has had experience with trail cams. Richard sent several suggestions and from those I picked the Bushnell HD. It has black LED flash and motion detection, which means that critters are not able to see the camera’s motion detection light or its flash. The camera is also very quiet – I cannot detect any sound at all when a photo is taken. Among other cool features is its ability to record video and audio, and time lapse images. 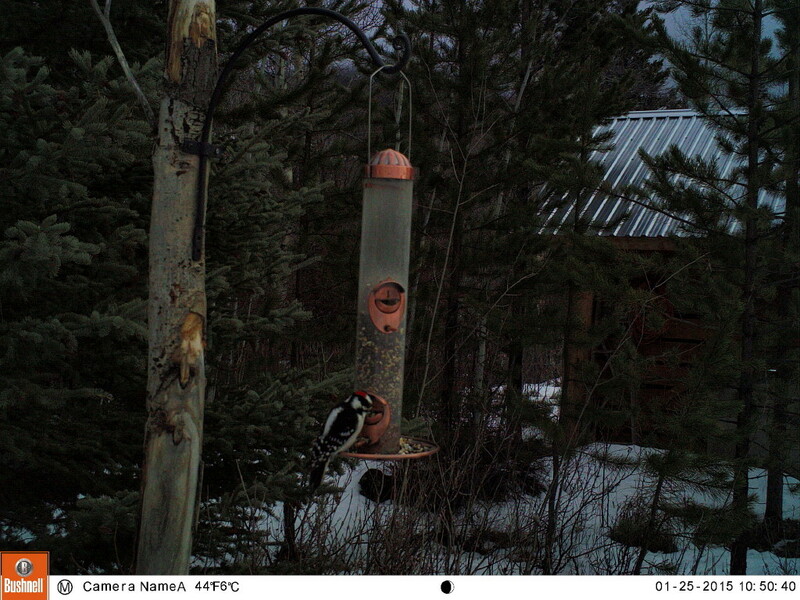 I received the camera via Canada Post a few days ago and right away put it to use at one of our feeders beside the house. I chuckled when I checked the camera after the first night of operation. It had recorded over 1600 images. Somehow I had it set to take a photo every two seconds when activity is detected. 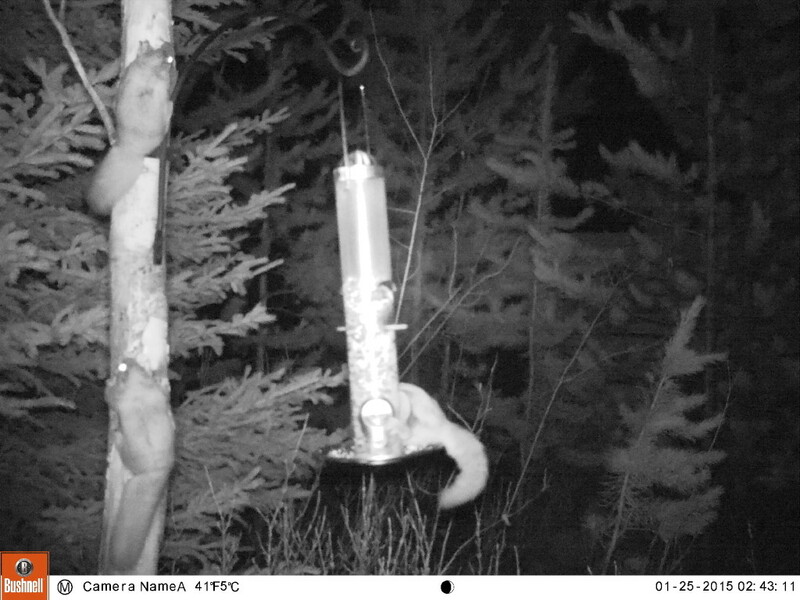 I didn’t count on a trio of Flying squirrels to spend four hours continuously on the feeder. The squirrels accounted for around 551 images; the remainder (1052) were daytime shots of the crowd of birds coming for their breakfast before I had a chance to turn the camera off (it was a Sunday). Fortunately, I can alter the camera program so that does not happen again. Each image is time and date stamped so I know that the first squirrel showed up at 12:46:51 AM and the last one was recorded at 04:20:01 AM. Below is a selection of some of the images collected. I have a few ideas about places to put the camera but would love to hear from anyone about your ideas on how to use it. The spillway of a beaver dam would be interesting for example. 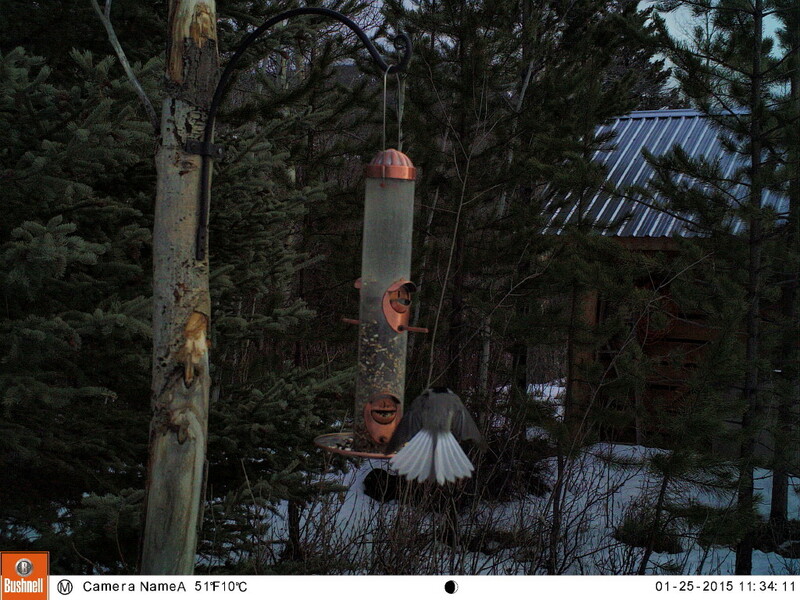 Or I could direct the camera to the ground beneath the feeder to see the mice and voles that earn their living on the bird’s spoils. If you look at the left edge of the picture you can see a pair of eyes.